Amelia Earhart: Speculation and Misinformation Shared through Media. Home – Amelia Earhart: Speculation and Misinformation Shared through Media. On June 1, 1937, Amelia Earhart, a pioneering American pilot, departed Oakland, California on an eastbound flight around the world. It was her second attempt to become the first pilot ever to circumnavigate the globe. She flew a twin-engine Lockheed 10E Electra and was accompanied on the flight by navigator Fred Noonan. They flew to Miami, then down to South America, across the Atlantic to Africa, then east to India and Southeast Asia. They reached Lae, New Guinea, on June 29. When they reached Lae, they already had flown 22,000 miles. They had 7,000 more miles to go before reaching Oakland. Earhart and Noonan departed Lae for tiny Howland Island—their next refueling stop—on July 2. It was the last time Earhart was seen alive. She and Noonan lost radio contact with the U.S. Coast Guard cutter Itasca, anchored off the coast of Howland Island, and disappeared en route. Speculation as to what happened and her whereabouts has spanned more than eight decades. It began as President Roosevelt authorized a massive two-week search for the pair with a declaration on July 19, 1937 that Earhart and Noonan were lost at sea. Interest has been global, since Earhart was circumventing the world in early times of aviation (see Amelia Earhart Coverage by Country chart below showing coverage outside of the US from the last 20 years). 1. She ran out of fuel, crashed, and died in the Pacific Ocean. 2. She landed safely on Gardner Island (now called Nikumaroro) but died before she could be rescued. 3. Her flight was a scheme to spy on the Japanese, who then captured her. 4. She crash-landed and was captured by Japanese military and died in captivity in Saipan. 5. She survived a Pacific Ocean crash and was returned to New Jersey where she lived out her life under an assumed name. 6. She survived and made her way to Guadalcanal. 7. Earhart crashed on a New Britain island. 9. She was captured by the Japanese and traveled to Emirau Island in Papua New Guinea. With so much interest Earhart’s case, these theories have sparked international debates. In the earnest efforts to reach closure and the fact that incident pre-dates digital documentation, it demonstrates how stumbling across new findings can lead to misinformed, erroneous conclusions. 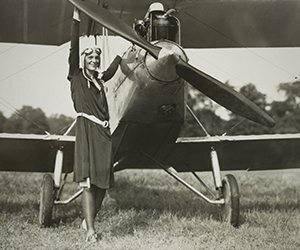 In the case of theory five (the assumed identity), a 1970s book titled Amelia Earhart Lives, claimed that she had taken the name Irene Bolan and lived in Monroe Township, New Jersey. Despite her resemblance to Earhart and pilot’s license, Bolan sued the author and McGraw-Hill resulting in an undisclosed settlement and a retraction of the publication. The ninth theory (captured by Japanese at Emirau Island) was the subject of a recent History Channel documentary, which unveiled a black and white photo recently discovered in the National Archives that claims the woman’s back in the grainy photo was likely Earhart. After airing the program, a Japanese military history blogger matched the photo to one published in 1935—two years before the infamous flight (which meant it could not have been Amelia). After the airing, the History Channel released a statement acknowledging the questions. The History Channel made a grave mistake airing a theory that was quickly refuted by an image from a published sourced. They were seen as creating a sensational story for the means of monetary gain with lack of clear evidence. Enthusiasm, intrigue, lack of digital documentation and global competition can cloud the research process. The Amelia Earhart book and TV story are good examples of the pitfalls of misinformation—taking that one more step to validate your news sources could save money and reputation. At LexisNexis, we help research professionals do just this with our comprehensive property records, vast online database and news archives. 1. Read these tips on getting the right information you need to succeed! 2. Learn more about how Nexis and research can provide better information, better results. What do you think happened to Amelia Earhart? Leave your thoughts in the comment box below!